Last week was certainly my best to date in terms of predictions on the year, so hopefully the momentum carries on through the rest of the season. It’s hard to believe, but after this week, every team in the league will have finished three quarters of their schedule. For that reason, it will be interesting to assess where teams stand at the end of this week. Right now, the majority of division races are going to come down to the wire minus the AFC East (assuming the Patriots keep doing Patriots things), the NFC East (strong division, but the Cowboys are playing too well), and the NFC West (despite the Seahawks not playing their best ball of late, they’re still three games above the Cardinals in the win column). So while this has been an interesting year for the league and fans in terms of self assessment regarding various issues, this final stretch has the chance to be a lot of fun. At the end of the day, even though they have emerged into more, that’s what sports are supposed to be for us as fans. Here’s to a great final five weeks of the season. Game of the week: Giants vs Steelers: Just seeing this game on the schedule probably required half of the league office to change their underwear. Both teams needing this win for their playoff hopes, the Mara’s and the Rooney’s (so much class!!) 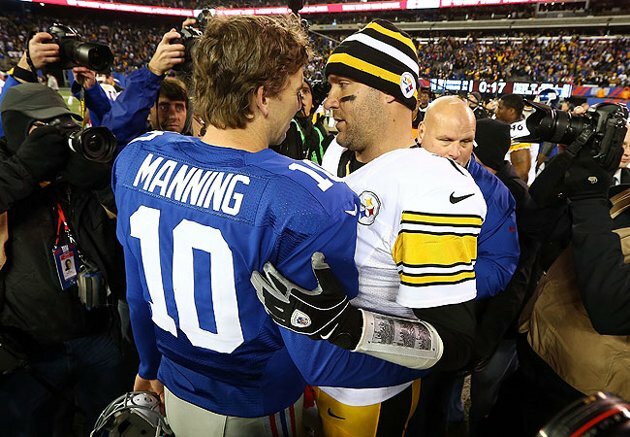 and the inevitable Eli Manning/Ben Roethlisberger comparisons because they were both drafted in 2004 and won multiple championships. In reality, we don’t need narratives to drive this game. The Giants have been on a tear of late winning six straight with three of those coming against the Steelers divisional foes. While impressive, that might also be an indicator that this simply is a really bad year for the AFC North. On the bright side, the Giants defense has really stepped up of late and has been able to come up big even when the offense isn’t fully in sync. This entry was posted in NFL, Picks against the spread, Week 13 Predictions and tagged 2016 NFL Predictions, 2016 week 13 predictions, Arizona Cardinals, Atlanta Falcons, Baltimore Ravens, Buffalo Bills, Carolina Panthers, Chicago Bears, Cincinnati Bengals, Denver Broncos, Detroit Lions, Green Bay Packers, Houston Texans, Indianapolis Colts, Jacksonville Jaguars, Kansas City Chiefs, Los Angeles Rams, Miami Dolphins, New England Patriots, New Orleans Saints, New York Giants, New York Jets, NFL, Oakland Raiders, Philadelphia Eagles, Picks against the spread, Pittsburgh Steelers, San Diego Chargers, San Francisco 49ers, Seattle Seahawks, Tampa Bay Buccaneers, Washington Redskins. Bookmark the permalink.